Have you ever wonder how the Swans did on a particular date in history or wondered which league or competition they played in? Well read on to find out exactly what happened, wherever and whenever the Swans played on 27th April. 20 years ago – Promotion chasing Notts County confirmed the Swans releation with a thumping 4 nil win at Meadow Lane in Endsleigh Insurance League Division Two. Jan Molby’s men had nothing to show for their efforts other than a disallowed first half goal from striker Lee Chapman. 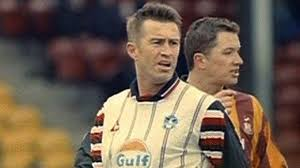 23 years ago – Goals from Mark ‘Chopper’ Harris and Andy McFarlane gave the Swans a comfortable 2-0 win at the Vetch Field over Preston North End in Barclays League Division Two in front of a 6,933 crowd. 25 years ago – A Vetch Field crowd of 3,152 watched a Mark Harris own-goal give Shrewsbury Town a 1 nil win at the Vetch Field in Barclays League Division Three. 25 years ago – Former Swansea City striker Álvaro Vázquez was born in Barcelona, Spain. The striker made 12 apperances for the Swans in the 2013–2014 season, having been signed on loan from Getafe CF by Michael Laudrup. 29 years ago – Any hopes Terry Yorath’s Swans had of making the play-offs slipped further away as Stockport County ran out 3-1 winners at the Vetch Field in Today League Division Four. All the 2,216 crowd had to cheer was a 38th minute goal from Sean McCarthy. 31 years ago – The Swans won 2-1 at Plymouth Argygle in Canon League Division Three thanks to goals from Derek Parlane and Chris Marustik. The win saw John Bond’s Swans move up a couple of places in their battle to avoid relegation. 32 years ago – A first half brace from Ian Walsh gave the Swans a 2-1 win over Middlesbrough at the Vetch Field in front of a Canon League Division Two crowd of 3,628. 35 years ago – The 2nd biggest Vetch Field crowd of the season (21,354) witnessed a pulsating 2-2 draw with promotion chasing rivals Luton Town, as first half goals from Tommy Craig and Leighton James gave John Toshack’s men a share of the spoils. 42 years ago – Harry Gregg’s Swans lost 2 nil at Exeter City in Football League Division Four.